Cutting property taxes by increasing state general fund spending, for most, would seem a contradiction. Over the past two decades, in part because of the complexity of the tax system, this is exactly what has occurred. Property taxes are reduced by increasing state spending for schools, increasing state aids to cities , towns and counties, or by increasing spending for the direct property tax refund programs. The changes encompassed in the governor's property tax reform and relief plan are reflected as increases in state spending for basic K-12 education and local aid programs - reducing reliance on local property taxes. The state assumption of the K-12 basic education levy is, in part, offset by a new state tax - the statewide levy on businesses. These changes, while increasing state spending, have the effect of reducing local property taxes. Of the increases shown for "Property Tax Aids and Credits," the governor's budget proposes spending $1.389 billion in FY 2002-03 for this purpose. Included in that amount is $255 million of one-time spending to move forward the July payment date for city and township aids from July to May. General Fund spending for the biennium under the governor's budget will be $27.324 billion, including a $1.389 billion increase associated with the state assumption of the K-12 Education basic levy and additional property tax relief provided through the state's local aid and property-tax refund programs. Based on the November forecast, current law spending for FY 2002-03 increases $781 million, of 3.2 percent over the FY 2000-01 budget. This growth represents what would happen if no action were taken - and before any governor's budget decisions. this is attributable to ongoing increases enacted in the 2000 legislative session, as well as current law formula and caseload-driven increases previously enacted in law. The governor's proposed general fund budget will increase $1.328 billion, 5.4 percent, before considering the impact of property tax reform and K-12 finance changes. New spending initiatives under the governor's proposed budget will total $709 million - about 2.6 percent of total recommended spending. This increase in spending is offset in part, by the $162 million change associated with the 2000 motor vehicle tab reduction, which treats it as a dedication of a portion of the motor vehicle sales tax receipts, rather than an expenditure. The following table displays recommended general fund spending for the biennium by major omnibus appropriation bill. 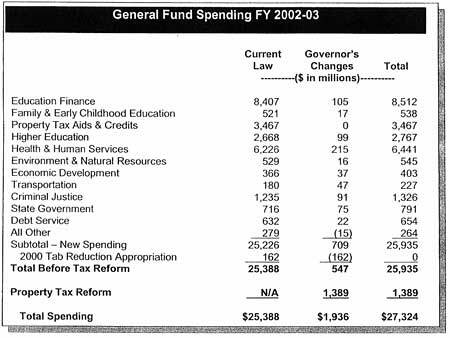 The table highlights the current law forecast "base" from November, 2000 forecast, highlights the governor's recommended changes and total recommended spending for the two-year period. Total spending is highlighted both before, and after, the effects of property tax reform related expenditures. In developing his recommendations for FY 2002-03 spending, the governor carefully considered the adequacy of current funding levels. The governor believes that the increased spending from the 1999 and 2000 legislative sessions represented significant, ongoing funding committments. Commonly, each biennial budget is measured against the preceding biennium - focusing primarily on how much new spending is included. It is important to consider total funding levels and increases or changes over the last two to four years in evaluating the governor's spending proposals. The table (above) presents biennial dollar and percent change for the FY 2000-01 biennium, as well as the governor's recommendations for FY 2002-03. As the table highlights when the K-12 financing costs and local aid components of property tax reform are included in total spending, the impact of these changes increase biennium to biennium spending growth to 11.0 percent.